Head over to Catch My Party to see the BEST photos of the Chestnut Street Carnival. My kids are featured in a lot of the pictures. Just click here to view them! Teaching my kids to cross the street safely is harder than you may think. This nerve-racking experience is now a bit easier with a book published by Greene Bark Press that I received for free in exchange for a review on this blog. We live by a very busy street that separates our house from the library, Isaac's school, and the park and pool. Even together this street is difficult to cross. The cars go so fast, and many don't slow their speed even when they see us in the street. Another stressful factor is that my little kids will run down the block to the very edge of the curb of this street. They just don't seem to have any street safety. 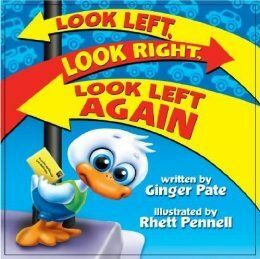 When we received Look Left, Look Right, Look Left Again by Ginger Pate in the mail I immediately read it to the three younger kids. I loved the rhyming text and the serious, but sometimes silliness, of crossing the street safely. Although the boardbook style would make you think it is for toddlers, the message it contains is appropriate for kids of all ages. Margaret really enjoyed the vibrant colorful pictures of the animals and the rhyming text. Henry laughed at the elephant part (actually everyone laughed! ), and he wondered why Wally had to mail a card to Grandma when she lived across the street. Although the message was lost on Malcolm, he enjoyed seeing the animals in the story and making their animal sounds. Who knew the tiger driving the train said "Neh"? It is a sturdy book that was creatively designed. The message inside is valuable to any family with young children. This would make a wonderful stocking stuffer or gift item. I enjoyed reading it aloud. I just love rhyming text in children's books. The little rhymes made it easier for them to remember the message. True story: I reread the book today to Margaret so her impression would be fresh for the review. When we walked down to Isaac's school to get him she sang in her sweet little sing-song voice, "Look left, look right, make sure the cars are out of sight. Remember then: Look left again." What Did My Product Testers Think? Do I really have to say have to say the rhyme when I cross the street or can I just look? Look Left, Look Right, Look Left Again is available on the Greene Bark Press website for $8.50. In addition to this book, the company offers many other books, games, toys, and puzzles. Check out their website for the complete listing. Other reviewers on The Schoolhouse Review Crew got a chance to share Look Left, Look Right, Look Left Again with their families. Click here to read their reviews, or click the banner below. A big week of change was had by all around here. 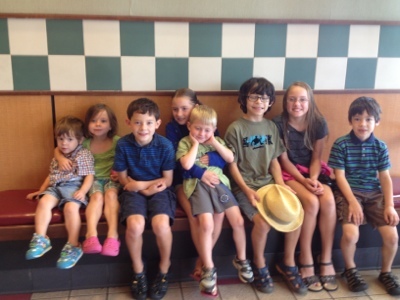 I am so happy that the homeschooling center we worked so hard to start is going so great. I had forgotten how exhausting it is to teach other people's kids. Kudus to all you full time teachers out there. Thankfully I only have to do this two days a week. It wouldn't be so tiring if I wasn't teaching so many difference things. We have yet to find a fulltime teacher for the first graders, so we are all taking a shift or two in that room. The additional prep for those classes is a little overwhelming. 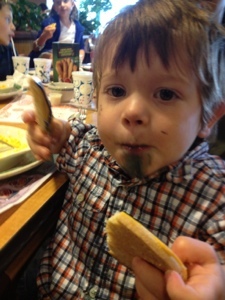 Isaac is adjusting, but it is a big change for him and so it's going to take time. I have never been as stressed as I was in August. There was just too much going on all at once. Michael planned a date night for us this week, and I was against it because of soccer, but we went anyways. So glad I did because he got us tickets to see Mumford & Sons. I LOVED IT! Things did not go as smoothly as we were hoping. The soccer coach had said he would be late to practice and just to drop the boys off. Some parents had volunteered to stay until he arrived. We had the babysitter drop James off. I had turned my cell phone off at Michael's request so we could have an hour and a half without the ding of texts and whatnot. Well, practice was cancelled 30 minutes before it started and there were messages galore about coming to get my son. I was in a bit of a panic there for a while, but as it turned out quite a few boys were there and James never even knew anything was up. Leaving the concert was also stressful. Traffic was at a standstill for TWO HOURS. We were three feet out of our parking space for two hours. No one was moving. We later learned that a big wreck had closed all lanes on the interstate. We should have been home at 12:30, instead it was closer to 3:00am. We're getting too old for these kinds of nights. One more thing, from the condition of the people stumbling around after the show, I am not surprised there was a wreck. I just hope no one was hurt. C'mon people! Don't drive drunk! I completely forgot to post photos of the Chestnut Street Circus! We were able to go all out this year because we were sponsored for the event by a party store. Notice the sign says "Chestnut Street Carnival." How awesome is that!?! Yeah, he rocked it again with his cuteness! There were lots of performers. Isaac on his slack line. Snow cones for everyone! We own the machine now, so if you are around and want one stop by! One more of the cutest clown. Ever. 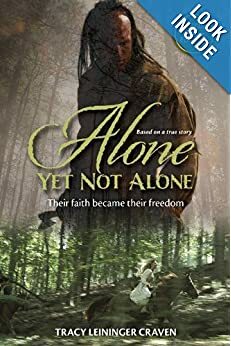 I was recently offered a free copy of Alone Yet Not Alone in exchange for a review on this blog. This historic story of the survival of three children after the Penn's Creek Massacre is intended for ages 8 and up and combines adventure, strength, and faith. I love historical fiction. The book was captivating from the very beginning which introduces the family on a simple homestead. It reads quickly as the family is attacked, the children taken hostage, and chronicles their survival, escape, and rescue. Although it is intended for ages 8 and up, I found some of the themes to be a bit mature for my young kids. The murder of their family, kidnapping, and separation of the sisters are all more intense events than are kids are used to. I would encourage parents to read the book beforehand to make sure it is suitable for younger readers. I am excited that this book has been made into a movie due to be released on September 27. Photos in the book showed the movie in production and it looks like it will be as captivating as the book. Find a theater near you by clicking here. I am pleased to offer a free copy of the book for one reader to enjoy before the movie's release. Simply leave a comment telling me about your favorite historical event and I will have my James choose a winner on Tuesday September 2. Good luck and be sure to check out the movie at the end of September! It was a day of real "firsts" around here. First time we had a kid go to five-day-per-week school. First day of LMCA. First time the kids went to a two-day-per-week school program. We had a rough start with Malcolm vomiting the night before. But everything turned out okay and I just pray it isn't the stomach flu. 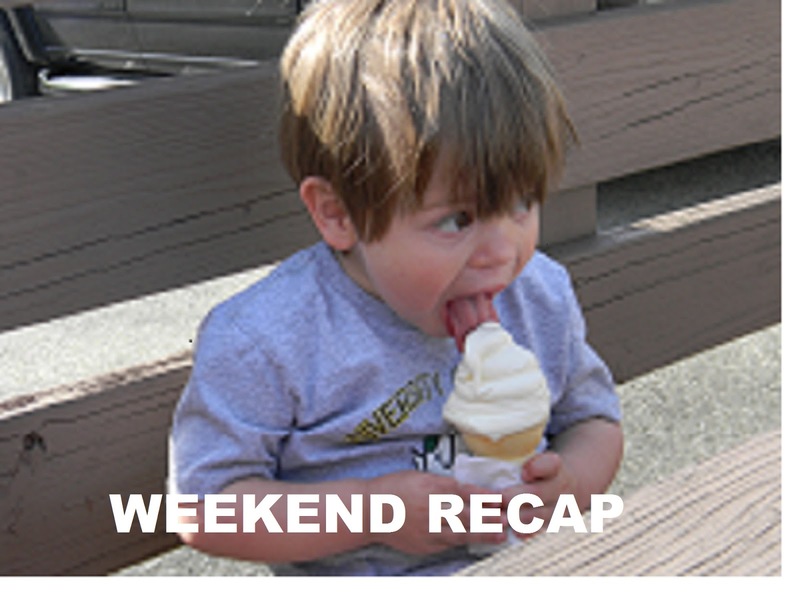 I am not sure why I am unable to do a weekend recap every week except maybe the fact that my weekends aren't that interesting to recap. In fact this recap is more than just the weekend events. My brother met back up with us at an Altoona Curve Games last week. Malcolm really rocked the game with his cuteness. We had amazing seats. Someone in our group even got a ball! There was no lack of silliness at the game. This weekend Latrobe was recognized as the birthplace of the banana split. It was kind of a big deal. Michael got Malcolm into 1950's mode. Which he immediately tried to ride on. All the kids got balloon animals. It was a highlight of the event. It was a great week and weekend. The perfect way to end our summer break. Tonight at dinner we had our annual "What was the best part of summer?" talk. Going to Portland was the winner, with going to Lake Edinboro close behind. Sculpting class and bike riding were also mentioned. Tomorrow is the start of a BIG week. Isaac goes to school, the other kids (and me) start LMCA, and Michael starts back at Saint Vincent. Soccer also starts this week! Yup, time to return to normal busy around here. 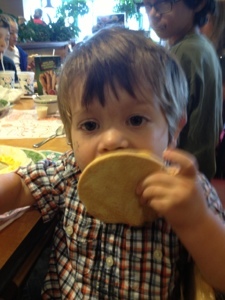 Our sweet Isaac is going where no Krom kid has gone before: He is going to brick and mortar school. Last night we went to his Open House and met his teacher, saw his desk, got his books and did all the things that tons of other parents have been doing for years. His teacher is Mrs. S. She is young, newly married, dynamic and excited, and is exactly the type of teacher that Isaac will love. It was all very surreal. She was so very nice and gave descriptions of her homework and grading policy, gym days, and uniform code. Mostly everything she said she repeated in a handout, which was a good thing because I spent the time staring out the window with tears running down my face. Because everything is changing. This decision should have been made for him for third grade instead of fourth grade. But it wasn't because I couldn't let go of the fact that what I offered him wasn't the best for him right now. That he needed a chance to spread his wings away from my protective nest. That being the middle of three boys born in three years really does effect him, and nothing I could give him at home could give him what he can gain by being on his own. He is going to shine. Although this isn't the best decision for me, it is the best decision for him. And my boy is going to shine like you wouldn't believe. 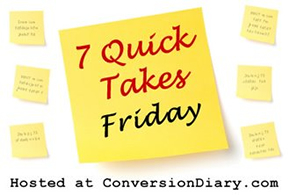 Head over to Conversion Diary to read Quick Takes not written by a sobbing woman. I am always looking for hands-on ways that my children can explore subject matter. One successful way we can make this happen is with lapbooking. A lapbook is just what it sounds like: a book that can fold out onto your lap. Lapbooks usually revolve around one unit of study (like knights and castles) and have moveable components. I always assumed the majority of them were designed for younger learners, so I was so excited when In the Hands of a Child offered me a free lapbook for James' level in exchange for a review on this blog. Lapbooks involve many different parts and it would take a long while for me to pull all those components together. In the Hands of a Child takes care of this aspect by providing kits that already pertain to a specific topic. They offer learners from Kindergarten to 12th grade over 450 topics to choose from, such as Ships and Submarines or Edgar Allen Poe. They are great as a stand-alone unit or as a supplement for an exsisting area of study. The products are very well laid-out and include a table of contents, planning guide, core concepts, research guide, reproducible graphics, and an answer key. At the end is a tutorial on how to fold a lapbook: a must have for anyone who has never completed a lapbook before. I absolutely love that the research guide is included and eliminates my need to head to the library and lug home a bunch of books that may or may not be relevant. I also like having the answer key because it means that if I don't have time to complete the lapbook reading I can still check the progress of my learner. You get to choose between three different formats for your product. All the formats contain the exact same materials, you are just choosing the way you receive the materials. 1) You can receive an e-book of your product, or an e-book with a type-in option for reluctant readers. From these options there are several ways to mix and match the formats to fit your needs. I encourage you to explore the website to see which format best meets the needs of your learner. James received the Law and Government e-book for his lapbook. This is perfect because PA Law requires him to complete some Civics each year and Civics is not my strong subject. We did the lapbook over the course of five lessons. We could have stretched it out to include additional readings and could have studied extra areas of interest if we had wanted to. I was just so excited to complete this unit of study because it is one more thing I can "check off" my list in relation to our homeschooling requirements. Plus, I know very little about this topic and learning it with James was so much fun. It was a little work to print up all the parts. I printed up the entire reading section for James to read on his own. He could have come over to the computer to read it, but I wanted it accessible for him to use as a reference. I also printed up the answer key for my reference. While he was reading the packet, I printed the components one at a time so that I could get them on different colored paper. This really adds a nice look to the lapbook. We didn't follow the instructions for how to construct the lapbook because we are lapbook veterans. My boys all agree that putting the lapbook together on their own is one of the best parts! If you are not using lapbooks, you should be! In the Hands of a Child is a great lapbook company because they have a wide variety of subject matter and many different options for ordering your lapbook. Their lapbooks are good quality and easy for even the youngest learners to complete. My kids start using lapbooks in kindergarten and we have used In the Hands of a Child for the majority of them. Our families favorite? The 12 Days of Christmas project pack. It's a great way to spend time learning about the 12 day tradition during the holidays. I really liked this because I learned a lot of things I didn't know about how laws were made and things like that. The lapbook was fun because we were making things about everything I learned. Law and Government Project Pack is intended for grades 4 to 8 and is available on the In the Hands of a Child Website for a special price of $5.00. Regular price is $10.00. Many other reviewers over at The Schoolhouse Review Crew got different lapbooks to review on their blogs. Click here to read those reviews, or click the banner below.